Take a trip to Japan, by way of NYC—without worrying if the next nor’easter will ruin your travel plans. Tokyo Record Bar, one of New York City’s hottest new restaurants, is bringing its unique experience to Boston this weekend. An 18-seat, basement speakeasy, Tokyo Record Bar opened late last summer beneath Air’s Champagne Parlor in Greenwich Village. Both “ornate curios,” to quote New York Times beverage writer Robert Simonson, are the work of Ariel Arce. At TRB, she pairs a prix-fixe dining experience with music and sake. Condé Nast Traveler calls it one of New York City’s best restaurants. Arce is coming to Hojoko this Sunday night, March 11, to DJ an all-vinyl set of requests, and host a six-course, collaboration dinner. 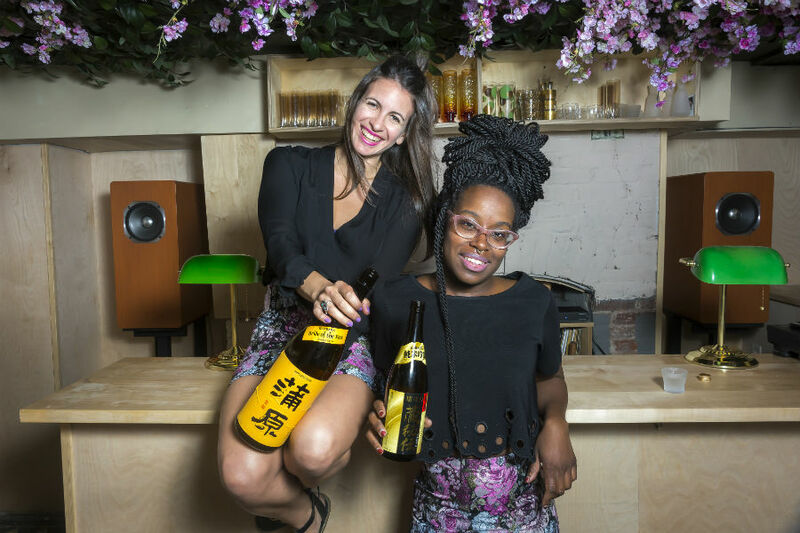 Record bars are popular in Japan, says Alyssa DiPasquale, advanced sake professional and communications director of Cushman Concepts, which owns Hojoko, O Ya, and a collection of New York City restaurants. But Tokyo Record Bar is unique because instead of curating itsown playlists, Arce has guests each choose a song for the night, from her curated vinyl menu. Since the Fenway’s rock ‘n’ roll izakaya opened with chef-owner Tim Cushman’s custom playlists, music is as important as the sushi and sake. Hojoko hosts live bands every Tuesday, DJs and dancing on Saturdays, and the People’s Karaoke every Sunday night. DiPasquale says she and the whole Cushman Concepts team, including co-owner Nancy Cushman, were immediately drawn in when Tokyo Record Bar hit the scene. Now they’re bringing it to the Hojoko front porch. This Sunday, Tokyo Record Bar beverage director Ashtin Berry is collaborating with DiPasquale and Hojoko bartender Daren Swisher on the sake and cocktail lists, and Hojoko chef Rob Wong is creating the menu. Arce, aka DJ Bubble, is bringing a selection of her vinyl library—but you choose what she spins. The family-style meal will take about 90 minutes, and karaoke is on after dinner—because what’s more Japanese than that? $80, Tokyo Record Bar x Hojoko, Sunday, March 11, 8:30-10 p.m., Hojoko front porch, 1271 Boylston St., Boston, 617-670-0507, hojokoboston.com.